Special steels like Hardox®, Strenx®, Domex® and Laser® help engineers with the difficult task of balancing performance and durability with cost and looks. There are several factors that complicate achieving this goal – aggressive environments, temperature changes, hard knocks, difficult bends etc. All these may result in cracking or wearing the metal very quickly. Therefore, choosing the right material is a way of combating those threats. SSAB’s steels fulfil the requirements for regular steels, while adding some extra. They all have more tightly controlled chemical compositions, narrower tolerances for thickness, flatness and other physical properties. All this means that you can rely on those materials – there are no surprises when e.g. cold forming them. Hardness – a material’s ability to resist a localised deformation induced by indentation. Ductility – a material’s ability for plastic deformation without rupturing. Strength – a material’s ability to withstand a load without plastic deformation or breaking. Special steels have a vital role in manufacturing. Where durability, wear resistance or bending qualities are essential, those metals come to the rescue. Hardox®, Strenx®, Domex® and Laser® are all SSAB’s steel grades that fill those needs. You may think that a thicker construction steel does the job when strength is needed. Actually, calculations show it does. But the construction will weigh more. SSAB’s homepage says that you can reduce a trailer’s weight by 30% when replacing standard materials with Strenx, for example. This makes for quite a saving in fuel consumption which is a key factor in the automotive industry. The second problem in the example of using thicker metals is bending difficulty. Thicker materials are more prone to cracking and the radii must be larger. Also, the bending machinery must be more capable, reducing the number of manufacturers with the right fit for your needs. There is also a lessened environmental effect to consider. Wear-resistant metals are great for hostile surroundings. Using a suitable material there can prolong the lifespan of your parts greatly and save the nature as well as money through that. In this article, we are discussing the three most popular of SSAB’s special steels – Hardox®, Strenx® and Domex® – along with Laser® that is gaining popularity because of it suitability for laser cutting jobs. In lower grades of Hardox® (up to 500), hardness is coupled with great toughness which means that the metal does not break due to knocks. The manufacturers guarantee that the plate is through-hardened which means that, at minimum, the core hardness is at least 90% compared to the surface hardness. This ensures that the wearing process does not fasten after the first layer of material is gone. Those properties make it suitable for producing whole constructions from Hardox®, without a fear of cracking. You can bend, form or weld it without a loss of promised mechanical properties. Still, those forming properties are good only compared to other wear-resistant steels and inferior to regular ones. With higher grades, the brittleness factor increases along with hardness. 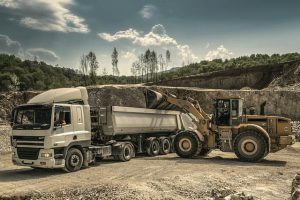 This means that using Hardox® as wear plates is a good option. For example, a conveyor may have replaceable Hardox® wear plates on the bottom of a “knee section”. This is the place where an otherwise horizontal conveyor turns up, making it the place in a long line where the hardest bangs occur. This kind of wear plates are fastened in a way that makes replacing them easy. Hardox® comes in different forms. You can buy plates, bars or tubes. They all have a series number at the end. For example, Hardox® 400 or Hardox® 500. The number indicates the surface hardness in HBW – a hardness in Brinell scale measured with a carbide ball indenter. While Hardox® 400 uses include applications with moderate wear, Hardox® 600 is for extreme conditions. Both are still suitable for welding, cutting and other operations, making its uses really flexible. The yield strengths also vary between those classes, but are not guaranteed, as opposite to Strenx®. Hardox® 400 has a typical yield strength of 1100 MPa. Hardox® 500 nudges that number already by almost 200, towards 1400 MPa. And Hardox® 600 has a yield strength around 1650 MPa. If you compare it to your standard structural steels, those values are a lot higher. For example, S355 has a yield strength around 355 MPa. Strenx® is another of SSAB’s steels. It is a high-strength structural steel meant for construction purposes. Actually, if you compare its yield strength to that of Hardox®, it is quite far behind. Those values are guaranteed, though. Its better bending and welding qualities make it a much more suitable for regular constructions where wear resistance isn’t of the utmost importance, while maintaining a similar price. Strenx® is often used in lifting equipment. 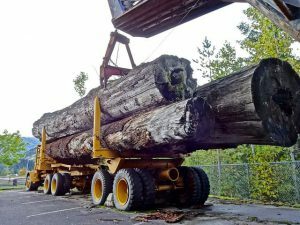 It makes it lighter and allows for higher loads because the motor’s work is used towards lifting something instead of spending half of the power on the crane itself. Also, in agricultural applications, soil compacting is an issue. 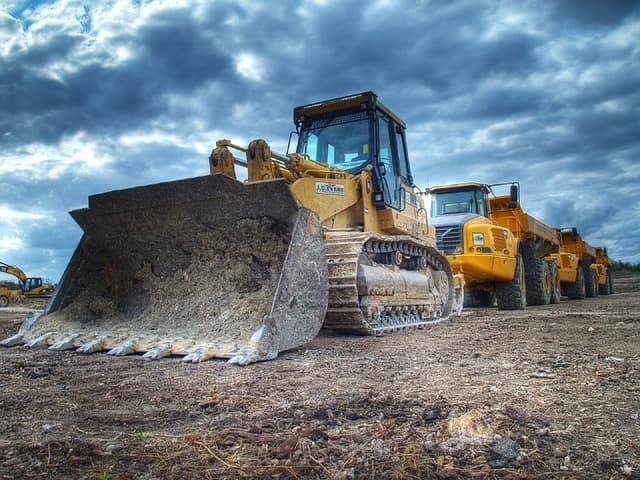 When using heavy equipment, the ground may be deformed. Therefore, lighter structures are preferred. With such machinery, fuel consumption is a key factor. Strenx® classes also have numbers. Though, the meaning of the numbers is different. Here, each number represents the steel’s yield strength. Strenx® 700 has a yield strength of 700 MPa, whereas with Strenx® 900 the value is 900 MPa. Pretty straightforward. Still, the values depend on the material thickness. Bigger thicknesses may have lower yield strengths than the grade number indicates. Some of the classes have an extra mark behind the number – MC or CR. MC mark indicates the steel’s suitability for cold forming. CR signifies cold-rolled products. Cold-rolling gives the material a superior surface finish, tolerance and straightness when compared to hot-rolled sheets. Domex® is also one of the most popular amongst SSAB’s steels. It belongs to the structural steel class. Still, there are some differences. For example, they suit excellently for cold forming, promise tighter tolerances, wider suitable welding process selection and consistent quality. Basically, this is your everyday steel grade that provides a little extra in every aspect. But the most remarkable of those qualities is its near-perfect attributes for bending. Domex® grades are also numbered. The number indicates the material’s yield strength. Looking around at SSAB’s homepage, you can see values starting from 220 MPa and going up to 550 MPa for sheet metal. Each grade also has a suffix – MC, ML, LA, and LAD. MC signifies thermomechanically rolled steels suitable for cold-forming; ML thermomechanically rolled steels suitable for low temperatures; LA steels are low-alloy cold-rolled steels, LAD ones are metal coated for corrosion protection. SSAB Laser® is a metal with excellent qualities for laser cutting. What does it mean? Laser cutting may result in bent metal because of the residual stresses in the steel. If a sheet bends during the cutting process, the cut holes can end up inaccurate. 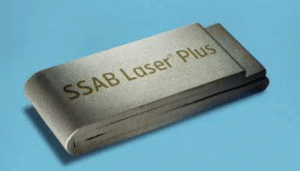 SSAB Laser®, on the other hand, promises flatness deviation of only 3 mm/m after laser cutting. In reality, the flatness measurements come back even tighter than that. 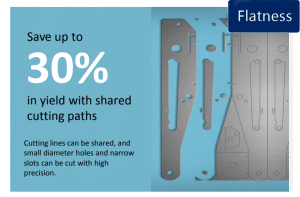 All this results in improved shape accuracy, no need for levelling, minimal collision risk during cutting, tighter nesting and shared cutting paths. The last point needs extra attention because usually you need to keep two details away from each other, so the material can deal with the heat. A weak point here is piles of scrap metal. Sharing cutting paths reduces this quite a fair bit. On top of these qualities, SSAB Laser® is also suitable for cold forming. The bending qualities are similar to the Domex® series, especially for the Laser Plus® metals. Again, the numbered grades represent the yield strength of the material. Starting from 250 MPa and ending with 460 MPa, these steels probably cover most of your needs. If you are looking to use any of those materials, we have them ready for you!